After up to years of being abandoned, he could have died in agony and alone, but Johnny the stallion donkey was blessed by an amazing lucky encounter. 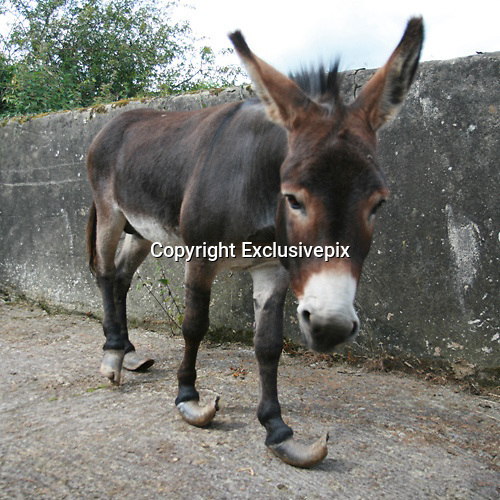 Left to his fate and in excruciating pain from overgrown hooves and twisted legs, the 10-year-old donkey was literally stumbled upon by a photographer taking pictures in the Mourne Mountains in Northern Ireland . Horrified at what he found, he alerted local police – and Johnny’s time in the wilderness was over. A rescue mission was launched by police and Allen Andrews, the Northern Ireland welfare officer of the Donkey Sanctuary. The donkey – named after the police officer involved in his rescue – is now being cared for at the sanctuary’s holding in County Tyrone where his feet were X-rayed by a vet to check for internal damage and his hooves trimmed to help him walk normally again. Johnny joins the thousands of donkeys rescued by the charity which supports projects to relieve the suffering of donkeys in 29 countries worldwide, including sanctuaries across Europe, where more than 14,500 donkeys and mules have been cared for, and major projects in Egypt , Ethiopia , India , Kenya and Mexico , where donkey welfare is improved through community education and veterinary work.